I’m so excited to be partnering with Unilever as a 2018 Agent of Change. This recipe features Lipton®, a Unilever brand. Looking for a new way to drink your tea? How about a tea latte? 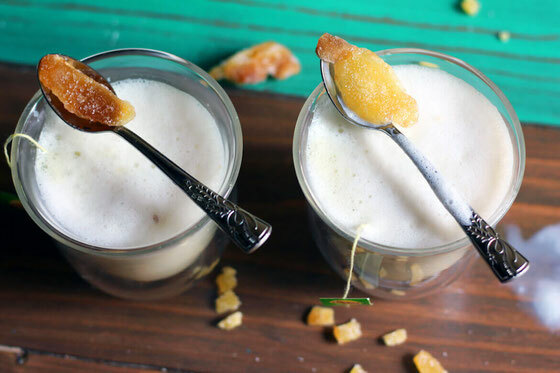 Warm up with a glass of this ginger-infused matcha green tea latte. It’s super easy to make! We had a long, hot summer in the northeast. But it’s finally starting to cool down, and I’ll soon be looking for ways to warm up. Fall is my favorite season, and I’m so excited that it's officially here! I love a hot cup of tea not only because it's soothing but also because of the health benefits it offers. Did you know that one cup of Lipton® unsweetened 100% Natural Green Tea boasts 150 milligrams (mg) of flavonoids? Consuming at least 400 mg of flavonoids daily may help you maintain good heart health! To get this amount, you just need to drink a few cups of green tea. And FYI that although I’m also a huge coffee fan, you don’t get quite the same amount of flavonoids from java. In fact, a cup of java offers only 0.4 mg of flavonoids, per the USDA Database Flavonoid Content 3.1. So tea definitely wins the flavonoid contest! You can drink your tea straight up—my tea kettle is one of the most heavily used tools in my kitchen!—or you can jazz it up a little. I decided to experiment. Up until recently, I'd ordered tea lattes at coffee shops but had never attempted to make my own. Well, the recipe I came up with is pretty darn delicious, and I can’t wait for you to embrace a homemade green tea latte. And most importantly, this version is super easy to make and ready in minutes. 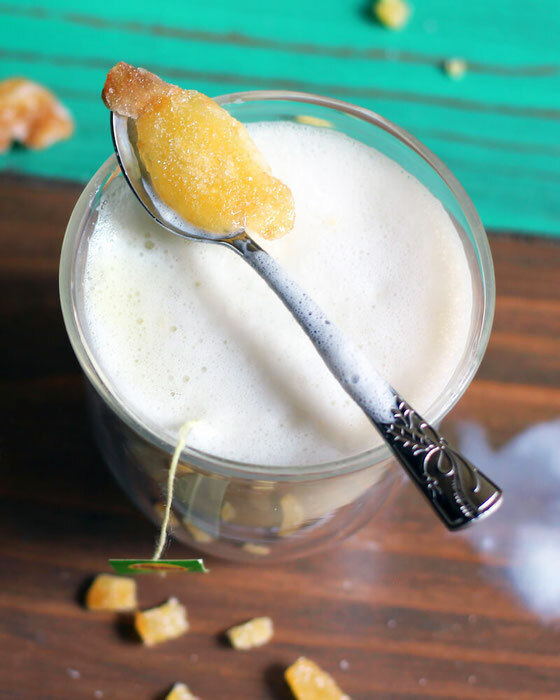 A tea latte is the most flavorful when made with strongly brewed tea. This delicious recipe can be made with Lipton® Pure Green Tea or Lipton® Matcha Green Tea, depending on your preference. In this recipe, I used Lipton® Matcha Green Tea bags in a half cup of hot water. This is less water than I’d use for a traditional cup of tea, but the concentration helps the tea get nice and strong—and turn a vibrant green. Then comes the milk! I combined low-fat milk with vanilla extract, then steamed and frothed it. I recommend using a milk steamer for this (see my top kitchen gadget picks!). Note that an electric milk steamer will be able to both steam and froth your milk, while many handheld milk frothers are only able to froth. 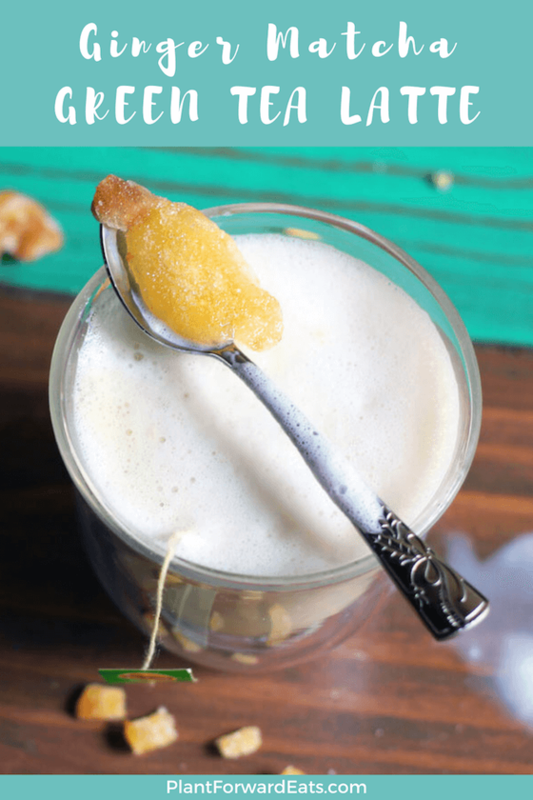 For a finishing touch, I added crystallized ginger to the latte. Delish! I’ll definitely make more tea lattes again very soon. Looking for additional ways to use tea in recipes? I love a glass of Tropical Green Tea Virgin Sangria, and matcha is also delish in Matcha Green Tea Energy Muffins. 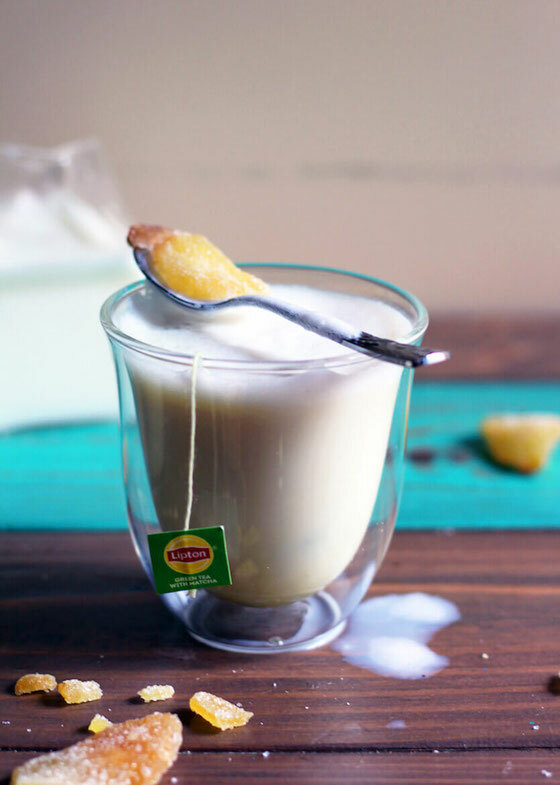 Here’s how to make a delicious green tea latte. Let me know in the comments below how you enjoy this recipe! Boil water in a tea kettle. After boiling, allow the water to rest for a few minutes. Transfer water to a latte glass or mug, and steep tea bags for 5 to 6 minutes. Once tea has steeped, remove tea bags. Meanwhile, combine milk and vanilla extract. Heat milk mixture in a small saucepan over medium-low heat, until steaming. Froth milk with a handheld milk frother. Alternatively, you may use an electric milk steamer to steam and foam the milk. Grate one piece of ginger and set side. Top tea with steamed milk, then spoon foam onto top of latte. Top with grated ginger; serve with remaining ginger. Makes 1 serving. What are your thoughts on this topic? How do you drink your tea? What are your favorite latte ingredients?